Editor’s note: This post is one of a series by Eric Whetzel about the design and construction of his house in Palatine, Illinois, a suburb of Chicago. 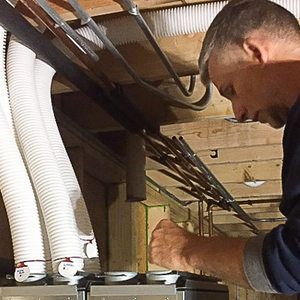 The first blog in his series was called An Introduction to a New Passive House Project; a list of Eric’s previous posts appears below. For more details, see Eric’s blog, . Our structure was designed with a “cold roof,” or ventilated roof assembly. By having continuous ventilation in our north and south soffits, with a ridge vent on the top of our roof, outdoor air can freely enter the soffits and exit out the ridge vent. The benefits of this set-up are explained in by the Building Science Corporation, plus the first two articles you see listed in the “Related Articles” sidebar below. We plan on using in the soffits. 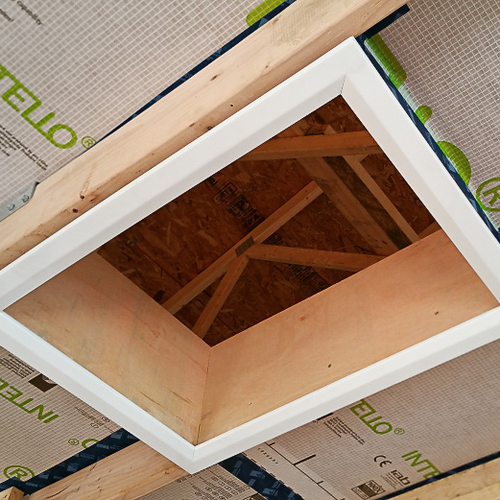 In order to make this kind of roof assembly work, ventilation baffles (also called ventilation chutes) are necessary, especially if the attic is going to have a significant amount of insulation, in particular blown-in insulation, that could potentially move around and block off the soffit ventilation from the attic, thereby short circuiting air flow from the soffits through the roof’s ridge vent. When it was time to install the ventilation baffles, I assumed I could just go to one of the big box stores and (thankfully for a change) just buy something off the shelf. It didn’t work out that way. 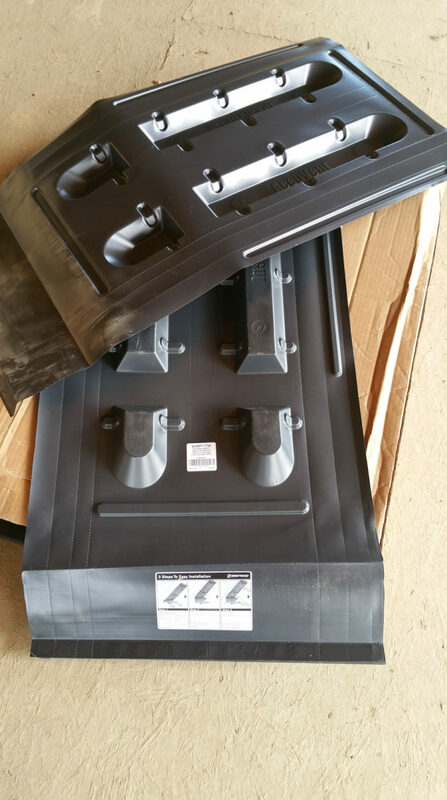 Home Depot had Durovent (a foam-based ventilation baffle) and an AccuVent baffle (black plastic). Both were a disappointment. I didn’t buy the Durovent — when I saw it on the shelf and handled it in the store it looked cheap and unimpressive. It was hard to imagine it holding up under the pressure of any significant amount of blown-in insulation pressing against it. Q&A: Is Soffit Venting Necessary With a Vented Rainscreen? Seeing the video made me think it would be an easy installation, but once I had the product and tried to install one, the realization hit that they would be a pain to air seal properly, and again, I had concerns about how it would do over the long term with blown-in insulation pressing up against it. I assumed there must be a sturdier plastic baffle, but I never found one. Instead, I came across this article by Martin Holladay. As usual, old reliable — GBA — had already addressed the issue. It was nice to have a solution, but I also knew it would be time-consuming and back-breaking (also neck-straining) — the only thing worse than working with sheet goods is working with sheet goods above your head on a ladder. Nevertheless, I would sleep better knowing it was panels of OSB rubbing up against two feet of blown-in cellulose insulation rather than sheets of flimsy plastic. Long-term solutions do wonders for peace of mind. I used 2×4 blocks as a base for each ventilation chute — first, screwing the blocks to the roof trusses, then after putting the OSB into place, screwing through the OSB and into the bottom of each block. The image at the top of this post shows the first chute after I had put it into place and sealed the perimeter with OSI Quad Max sealant. There weren’t always sizable gaps where the OSB chute met the top of the Zip wall sheathing, but they did occur. When there was a gap, caused by a bend in the OSB chute or unevenness in the top of the wall sheathing, it looked like Image #3, below. These gaps could be fixed with narrow strips of OSB and OSI sealant, in the end looking like Image #4. I showed up on one rainy morning to continue installing the chutes. Image #5 shows the dramatic difference in before and after — light spilling into the interior through the soffits without chutes, and with chutes installed and sealed on the right. Image #6 shows the top of the wall from the outside with an air gap that will allow air to flow from the soffit into the attic, and then out at the ridge vents. 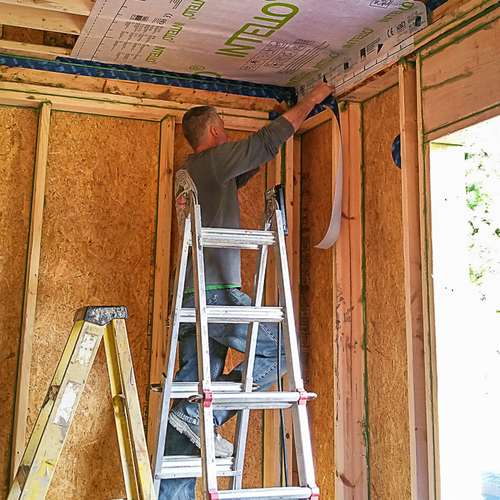 Once the chutes were installed, I was finally ready to put the Intello membrane on the ceiling, which thankfully I didn’t have to install by myself (Image #7). I’ll describe that process in my next post here at GBA. This is a timely post. I will be installing baffles in my own house project in the next few weeks and also have been underwhelmed by what is commercially available. It is a standard loose-fill attic fill and I have about 3.5" gap caused by my top truss rafter between my wall sheathing and roof sheathing, so a baffle will need to include an angled bottom, similar to the article. Reading the issues discussed, I am thinking it may be viable to cut strips of EPDM rubber to a few inches wider than truss spacing and staple them to the rafters with the appropriate gap along the top. The bottom strip can be left long and hang down to be stapled to the wall's sheathing or top plate. This should provide a reasonable seal, but a bead of Tremco could also be applied, if desired. I have quite a bit of EPDM left over from gasketing floor, wall and roof penetrations and may try it. If the EPDM laps up the sides of the rafters too much the path to drying (through the rafter) gets to be pretty long, and that can matter. Using EPDM flashing tapes to seal any angled bits might make sense, but in general it's safer if the baffles themselves are at least somewhat vapor permeable. Eric's use of OSB is less than ideal, and may not work for every house. Using 1/2" or thicker MDF or asphalted fiberboard sheathing instead of OSB would have the advantage of MUCH better drying capacity- more than 20 perms at humidity levels that matter. If supported with a roof-deck spacer strip the full length at the mid-point between rafters would be able to withstand dense-packing pressures. thanks for the comments. I can see where using EPDM would be a potential issue when using it for the entire cavity, such as a dense-packed cathedral ceiling. But, is it still an issue in a typical attic where the lengths would only be 24-36" long or so? I would think the huge area of insulation exposed to air would allow a reasonable vapor path, even if wetness occurs right around the truss heel. Also, there seems to be a lot of vapor impermeable products (plastic or foam) on the market. You're absolutely right- in a fully vented attic with the chutes only at the edges it really doesn't matter. Off topic, but do you not have any ceiling sheathing, or is it beneath the membrane in picture 6? 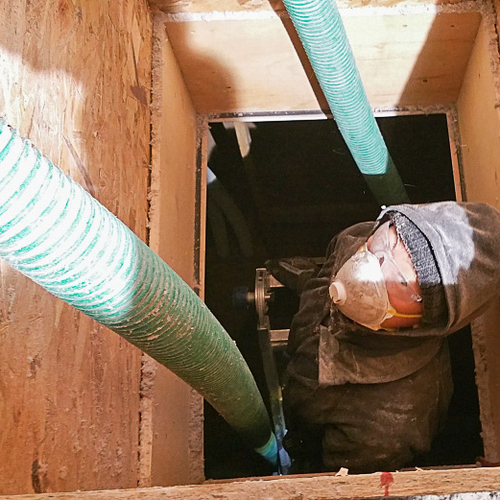 The photo shows the Intello membrane, which was installed before the ceiling was installed. Beneath the Intello there will be a 5.5-inch-deep service cavity, and then the finish ceiling (presumably drywall) will be installed on the underside of the 2x6s used to create the service cavity. Ok, so the insulation is supported by the membrane then. That's what I was wondering. I would think that's a lot of weight to place on the membrane. Stay tuned -- all the details will be revealed in time. This is a blog series, and you have to be a little patient. Spoiler alert: 1x4s will be installed under the Intello to help support the insulation.